Clown triggerfish (Balistoides conspicillum), also known as the bigspotted triggerfish, are demersal marine fish belonging to the family Balistidae, or commonly called triggerfish. 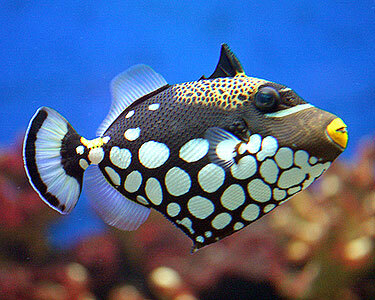 The clown triggerfish grows up to 1 1/2 feet (50 cm). Its body has a stocky appearance, oval shape. The first dorsal fin is composed of three spines, one of which is longer and stronger. It is erectile and hidden in a dorsal furrow. This set of dorsal spines composes a trigger system. The larger spine is used to lock into rocks making it harder for a predator to attack. If you pushed on this larger spine trying to get it to lay down, you would fail. Yet if you simply and lightly push the smallest spine like a trigger to lay down then the larger ones would fold as well. Trigger's have a varied diet and eat mostly molluscs, echinoderms and crustaceans. The clown trigger fish is widely distributed throughout the tropical and subtropical waters of the Indian ocean and the western Pacific Ocean, however they can also be found in the caribbean as well. It is most commonly found along external reef slopes with clear water up to depths of 250 feet (75 m).